From the minds of Ganbarion, better known for their anime-related games such as the Shonen Jump properties, comes a title you don’t see every day. 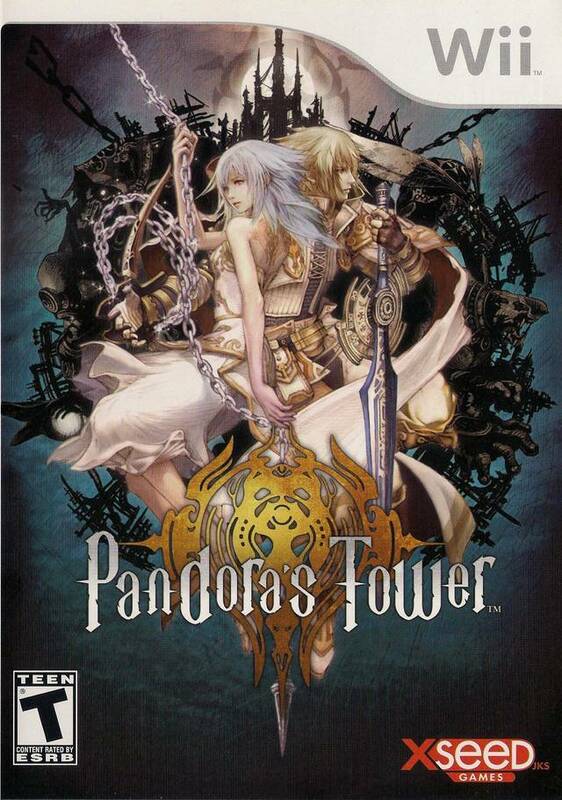 This game is Pandora’s Tower, which for a while many didn’t think would ever be localized. Then came Nintendo of Europe to properly localize the title for Europe, and right then and there, the only question remained, “Will it ever come to North America?”. That question would remain unclear until early this year; lo and behold, XSEED once again swooped in and saved another niche title that needed some help. So with all that said and done, does the game actually have any merit? Or was the campaign spawned simply out of interest for the game’s concept and the lack of titles on the console? You fill the role of Aeron, a soldier of the Kingdom of Athos, which is locked in a conflict with the kingdom our other main character, Elena, originates from: Elyria. The war has been going on for five centuries, with no end in sight. The story begins at the Elyrian capital city of Helycon. Midway through Elena’s performance, she’s stricken with the Beast’s Curse for reasons unknown and all hell breaks loose with her transforming briefly. Aeron, watching from afar in disguise, tries to go to her aid in the ensuing chaos. It’s then he meets up with a bizarre Merchant of the Vestra, named Mavda, who informs him of Elena’s predicament and guides the two out of the city with the Elyrian army giving chase. After days spent in the countryside, they arrive at their destination and main setting of the plot, the Thirteen Towers. The towers are suspended over a giant chasm called “The Scar” by a number of giant chains, and the on-looking Observatory close by is used as a home base. It’s there she tells of the curse and the horrors that await Elena if Aeron cannot lift it. How he goes about doing so is to use the Oraclos Chain given to him by Mavda to gather Beast Flesh; more specifically, Master Flesh. Feeding Elena the Master Flesh of each of the 12 Masters that reside in the 13 towers is the only way to remove the curse for good. And with a subtitle like “Until I Return to Your Side”, you can expect a good part of the plot to focus on the relationship between our two main characters. The game has both a soft and a dark tone, with the lightheartedness of romance to issues of war, experimentation, sacrifice of one’s self and a bloody past that is shrouded in mystery, all while the heroine is slowing turning into a monster. The curse only gets worse and worse as time passes and depending on how much time you spend in the towers. How much of the game’s plot elements get explored is all dependent on you. The world building, character development between your two protagonists, their back story, information about the past, and details of each tower is gained by collecting notes in the Observatory and in the towers, with Elena translating the unintelligible ones. The game has very few cutscenes, most of the time only appearing after you progress the plot by feeding Elena a piece of Master Flesh. They show her flashbacks pertaining to the mystery of the 13 towers and the formation of The Scar. Others are unlocked through giving her specific gifts, or by how far you go in the affinity meter. While the plot does seem reminiscent of the game Shadow of the Colossus, it takes that concept of bosses and a love story and diverges to uncharted territories. Seeing the pain and misery our main characters go through is quite saddening. Elena being such a likable character only makes it worse when you see her in such an awful state if left unattended for too long; even worse, it’s all your fault. To make me care about a character that way, to make me feel a certain happiness when succeeding or giving Elena a gift she will cherish, to even make me feel like utter crap for basically taking my sweet time in the towers and finding her cuddling in a corner in the Observatory; its more than a punch in the gut – it’s heartbreaking. While the game’s story is something in itself, I see it as more of a character-driven story, even with Aeron being a silent protagonist for 90% of the game. The story in Pandora’s Tower is only fully embellished by the work you put into it, and you’ll be rewarded for it, all the way to the bitter end. The game is divided into two integral gameplay elements. One is at the Observatory, which the characters made into a make-shift home. Here is where you’ll be doing all the interactions with Elena with a visual novel-like dating aspect, along with sleeping for health regeneration or to change the time. You can also save your progress, store your items and buy/create/repair/upgrade equipment from Mavda with the help of her husband carried on her back. With each tower cleared, more items can be bought or created through her. One of the most important items that she sells, besides the necessities for Aeron to use in the towers, are gifts you can acquire through simply buying or creating them to give to Elena. Gifts can help increase your affinity with Elena a lot faster and gives varying good results. This is what makes her AI special; give her enough gifts, she starts giving you gifts herself. Give her a dryad berry and she will make a healing item out of it. Give her your amulet and she will start wearing it, even commenting about it if asked. Give her a piece of cloth and, with her sewing skills, she will extend your bag capacity; she’s quite handy, to say the least. When given certain gifts such as pots of plants or drapes, she will customize a bit of the Observatory to make it more home-like. She doesn’t just stand or sit down for 24 hours in game time, but has a schedule of activities that will also bring in new dialogue, depending on your affinity. So gifts aren’t everything, just simple chatting could bring some lighthearted moments that are, quite honestly, very adorable and quite comical at times. There’s still dialogue and events I haven’t seen or heard yet; there’s just that much. She also has events where you simply eat breakfast together and chat, giving you a heartfelt farewell when you leave for the towers. Simple additions like these flesh her character out without making it the main attraction of the game; a certain level of depth missing in other games that use this mechanic. She’s not thrown in to try and create cheap emotional baggage, or used as a simple plot device to give a reason for the main character to go through the trials of the towers. She feels like a real character, and the relationship between Aeron and her feels genuine. In this regard, Pandora’s Tower really succeeds. The second type of gameplay is the action-platforming in the 13 towers themselves. You will be spending a good majority of your time in these towers, in what would be close resemblance to the level designs of the 3D Castlevania titles. Aeron’s most important weapon in his arsenal, the Oraclos Chain, utilizes motion controls. The chain is used as a means of fighting enemies, solving puzzles, navigating obstacles, and creating pathways to progress. The objective of each tower is to kill each Master, but before you can fight the bosses, you need to destroy a number of chains that connect and lock the Master’s room. Each lock is hidden away in the elaborate towers, with most of them needing a bit of problem solving to get to them. Monsters roaming the halls range from large beasts to little bite-sized enemies to giant impeding monsters that require more than just your simple melee weapons to take on. You start out with your trusty sword, but soon get more weapons like two dual blades and a scythe, all of which have their own strengths and weaknesses and enough upgrades gives you more charged attacks in the process. The chain has numerous uses within battles, such as pressing the B button to zoom in to use it like a slingshot to take out flying enemies, grabbing objects and chucking them like projectiles, or spinning the target with the flick of the nunchuck. Another cool ability of the chain is the ability to attach it to two monsters, so that when you attack one monster both enemies receive the same level of damage. Then, of course, the chain has more uses outside of battle such as pulling levers, bars and crates, obtaining items too far from reach, pulling Aeron up to higher ground and much more. So while the other weapons can be underwhelming, even repetitive, the chain makes up for it in strides with its various uses. The chain’s ability to grab specific parts of a monster plays an important role not only to weaken, hinder, or make enemies vulnerable in battle, but also in gaining components for creating other items, upgrades and more. The most important item to grab is the weaker version of the Master flesh, the beast flesh, which helps fight the curse and keeps the curse gauge from dropping all the way. While you’re combating monsters and destroying the chains locking the Master’s rooms, and even fighting the Masters themselves – you are under a constant time limit in the towers, making sure Elena doesn’t go full beast mode. Thankfully, you are given a good amount of leg room to work with, though taking your time could amount to losing some affinity progress. Even worse, if you let it sink to the bottom, then it will be too late and it’s game over. Some may be put off at the idea of being forced to rush through the levels and having to manage their time in general. Fortunately, the developers remedied this by giving you the ability to make shortcuts in each of the towers, so you’re never forced to run through an entire section of a tower all over again. It will depend on how you go about it. Will you take the risk and keep progressing until you get to a shortcut? Or will you go back and retry a portion again, knowing the layout and having the knowledge to do better? In the end, the time limit is a double-edged sword. Having to backtrack to give Elena meat could either create tension or simply annoy and irritate you enough to not want to finish the game. While the towers aren’t the most elaborate when it comes to layout, they have a good enough length that it doesn’t feel too padded for the sake of extending the play time.